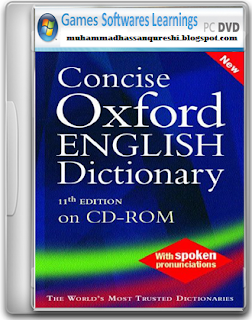 Oxford English Dictionary 11th Edition Revised 2008 Now in print through its various editions for almost a century, the Concise Oxford English Dictionary is one of the most popular choices in Oxford’s renowned dictionary line, selected by decades of users for its up-to-date and authoritative coverage of the English language. This revised eleventh edition of the Concise Oxford English Dictionary presents the most accurate picture of English today. It contains over 240,000 words, phrases, and definitions, providing superb coverage of contemporary English, including rare, historical, and archaic terms, scientific and technical vocabulary, and English from around the world. The revised edition of the dictionary has been updated with hundreds of new words including sub-prime, social networking, and carbon footprint all based on the latest research from the Oxford English Corpus. In addition, the dictionary now features an engaging new center section, with quick-reference word lists (for example, lists of Fascinating Words and Onomatopoeic Words), and a revised and updated English Uncovered supplement, which examines interesting facts about the English language. Sprinkled throughout the text are intriguing Word Histories, detailing the origins and development of numerous words. The volume also retains such popular features as the hundreds of usage notes which give advice on tricky vocabulary and pointers to help you improve your use of English. Finally, the dictionary contains full appendices on topics such as alphabets, currencies, electronic English, and the registers of language (from formal to slang), plus a useful Guide to Good English with advice on grammar, punctuation, and spelling. Hi, very good article.thanks for sharing.